By far our most popular system in bathrooms, for it's flexibility in covering any shape and size of room. 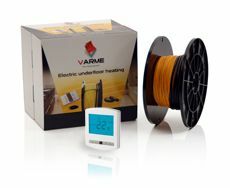 Like the cable mat, it can be laid onto existing floors and covered by tile adhesive, but comes as one length of cable which is layed out and run into any shaped room or area. Cable kits can be used in any room, no matter how irregular the shape.